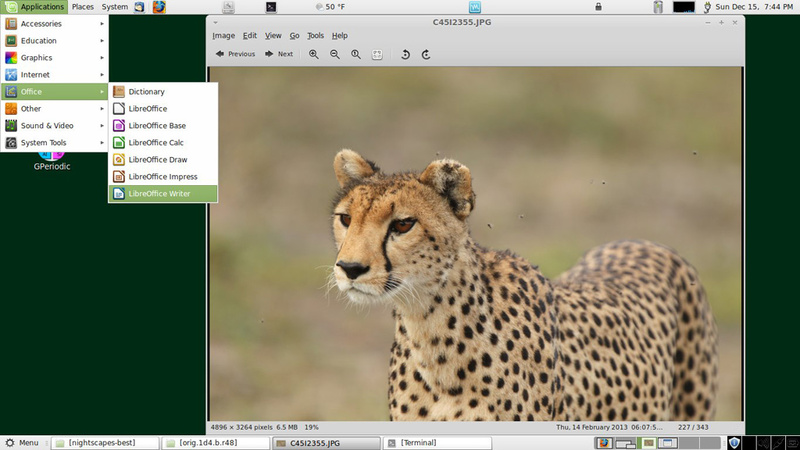 Linux Mint Mate desktop is easy to use with great capability and functionality. 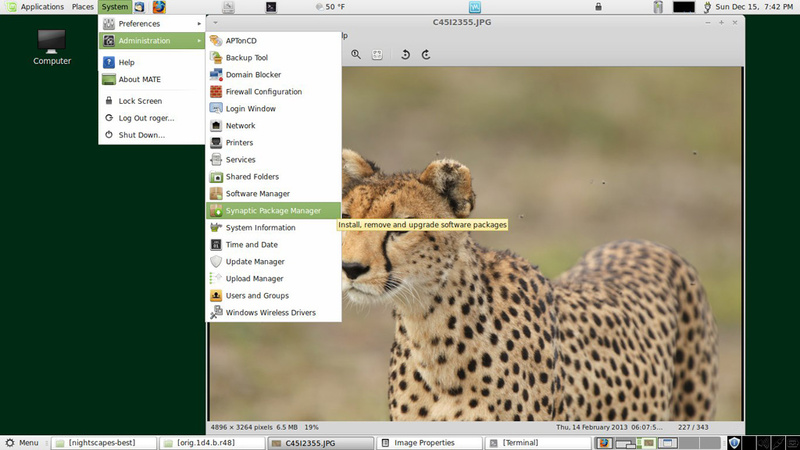 This page gives examples of the Linux Mint desktop with the Mate interface. 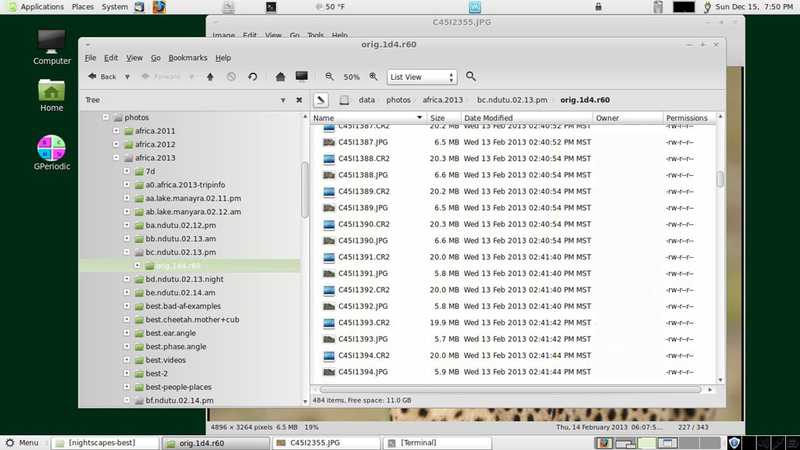 Specifically, this is Linux Mint version 14 on the laptop I carry to the field on photo trips. Figure 1 describes the boxes in the panels. The default installation includes only one application panel (on the bottom) and only 1 workspace defined. Right click on the application panel and a menu comes up where you can add a second panel and add things into the panel. The panels need not be top and bottom; they can also be on the sides if you prefer. Figure 1. 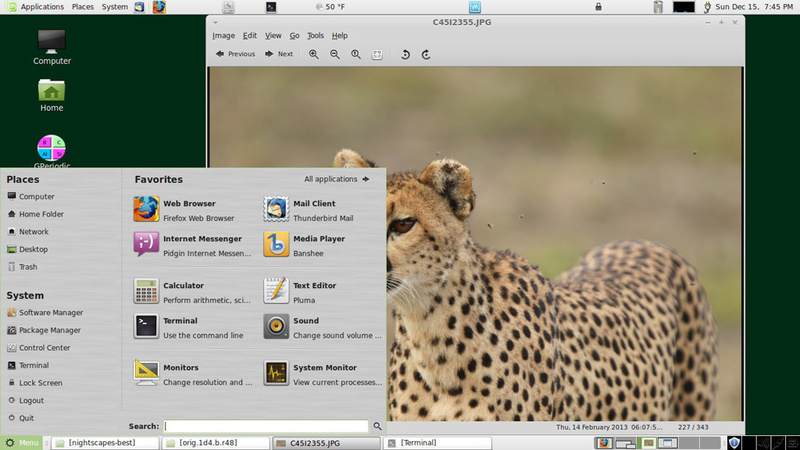 Example Linux Mint with Mate desktop. Figure 2. Example file browser with list view. What columns are displayed are customizable. The owner field was erased in the figure to reduce spam to that user. Figure 3. Example file browser with icon view. The size of the icons can be change with the zoom feature, and switching between icon and list view is quick with the icon button. Figure 4. 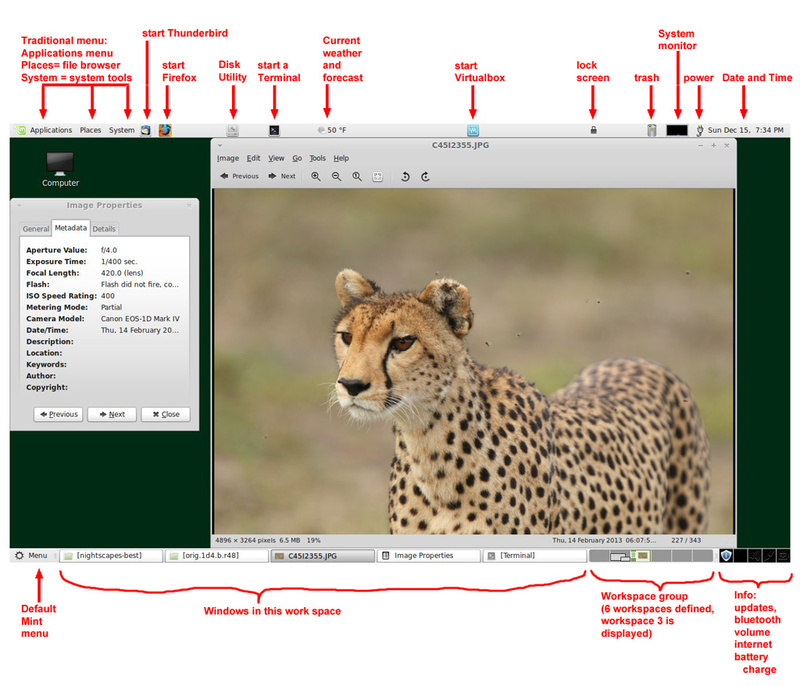 Example switch to workspace 4. 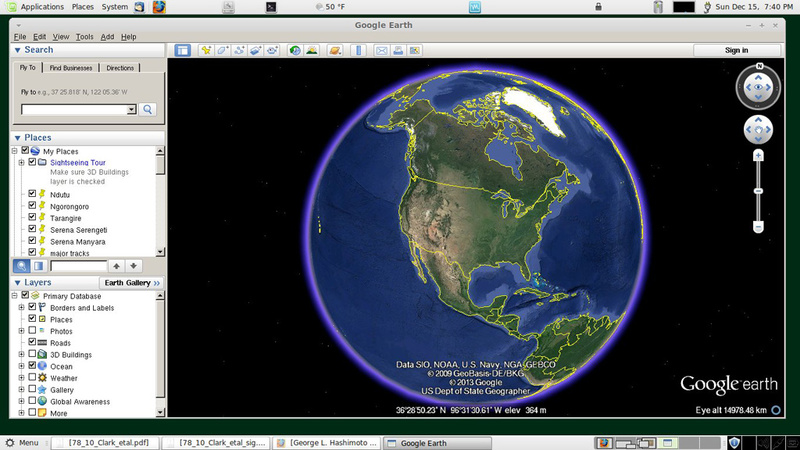 In this workspace, I started Google Earth. Figure 5. The System menu. Here the Synaptic Package Manager is selected. The Synaptic Package Manager allows very easy installation (and removal) of programs. Figure 6. The Application menu. Here, Libreoffice word processing is selected. Figure 7. The Mint default menu. This is more like Windows 7, which I don't like because if a program does not appear on this menu, one goes to all programs and then one must scroll through a huge list. I find the applications menu in Figure 6 more efficient. Figure 8. The disk utility. Shown is the system disk on my desktop. Notice the "disk is healthy" green dot. The system continually monitors disk drive health and alerts you to problems. This has saved my data when a drive started to fail: I copied all the data to another drive before failure. 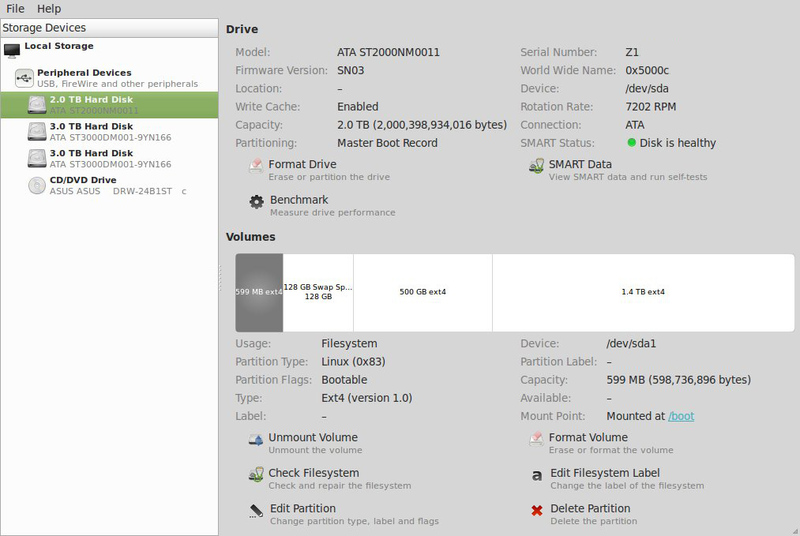 Clicking on the Smart Data gets a full report on the disk drive. Figure 9. Synaptic Package Manager. Installation is as simple as click on a package, select install from the pop-up menu and then click apply. Uninstall and reinstall are equally easy. 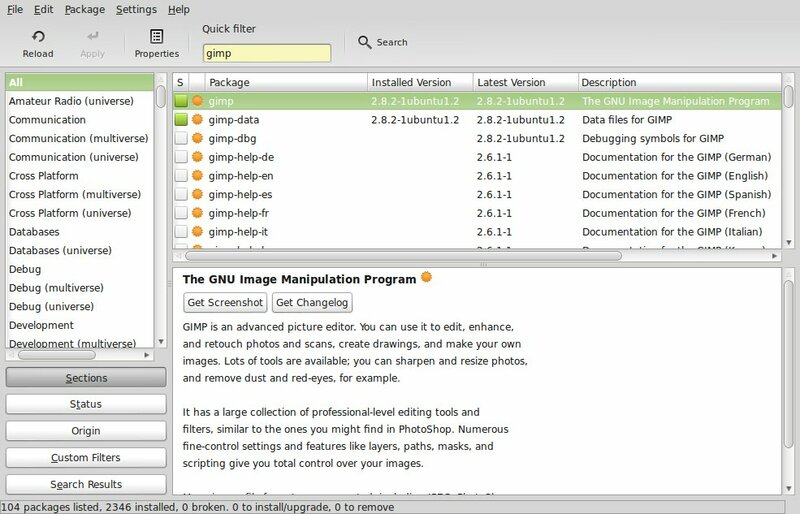 The green square by Gimp shows that it is already installed.